Features: Raw roasted organic barley. Torrefied up to 230 ºC. The length of roasting time determines the darkness of the grain. Characteristics: Château Roasted Barley Nature is a highly roasted barley that imparts a burnt, grainy, coffee-like flavor to your beer. It has many characteristics of Château Black Nature malt, though it is far more complex. It actually has some starch that can be converted during the mash, thus impacting the specific gravity. Château Roasted Barley will also lend to the sweetness to the beer. If compared to Château Chocolat Nature and Château Black Nature malts, organic roasted barley produces the lightest colored head. Imparts a deep red mahogany color to beer and very strong roasted flavor. Gives dryness to organic Porters and Stouts. Characteristics: Château Wheat Chocolate malt is a highly roasted malt, though not as high as black malt. With the help of this malt a deep brown colour with hints of black coffee and bittersweet chocolate flavour can be achieved in beer. The wheat version of Chocolate malt has a more pronounced dark chocolate character compared to its barley counterpart. This malt adds colour and flavour to a wide variety of dark beer styles and is used to smooth out certain English-style dark beers, such as stouts, porters, or brown ales. Château Wheat Chocolate is husk free and was especially developed by Castle Malting to avoid astringency, bitterness and dry flavour or aftertaste in beers. This malt can replace in a proportion of 1:1 the de-husked* chocolate malt, imparting a smoother flavour. Usage: English-style dark beers, stouts, porters, or brown ales. Up to 20% of the mix. Features: Certified organic malt. Light brown caramelized wheat malt. Is produced in a roaster from green wheat malt. High caramelization level. Characteristics: Malt Château Cara Wheat Ruby Nature imparts a sweet candy taste with mild notes of almond and biscuit. Adds creaminess and body to finished beer. Malt Château Cara Wheat Ruby Nature is well suited for color adjustment and flavor enrichment. 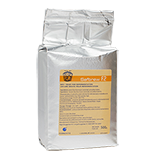 Is used to improve foam and foam retention. This malt has no enzymatic activity. Features: Two row spring malting organic barley is selected for the production of our Château Distilling malt. Barley is steeped to 44 - 46% moisture, slightly higher than normally required for Organic Pilsen lager style malts. Germination temperatures are controlled between 12°C - 16°C for a period of five days. Kiln cycles start at 50° - 60°C rising to 70° - 75°C. 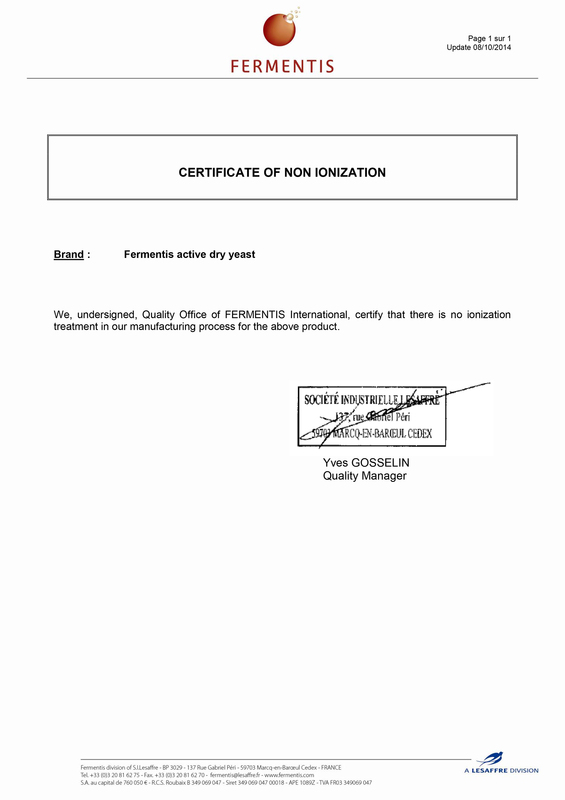 Characteristics: This is a premium Distilling Organic malt produced especially for the distilling industry. It is used for the production of quality grain organic whisky. Château Distilling Nature malt promotes high fermentability, adequate enzyme potential and soluble nitrogen (protein) levels. Our Château Distilling Nature malt is gently kilned to preserve enzymes and maximise fermentability. Usage: Any type of organic whisky, real Scotch whisky. Up to 100% of the mix. Features: The palest Belgian Caramel organic malt produced according to a special malting process. 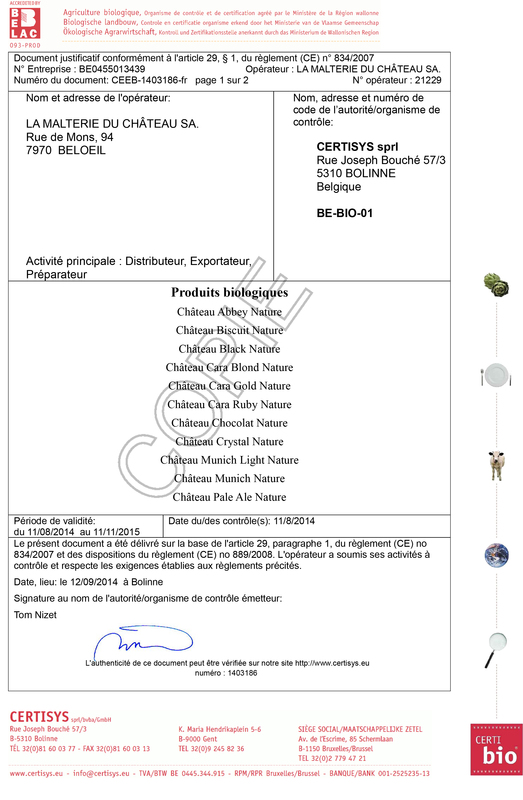 Characteristics: Château Cara Clair Nature is a type of Belgian caramel malt. Intensifies the beer’s body and its smoothness, promotes head formation and retention. This malt also called Dextrin malt and is the most common body and foam enhancing natural agent that enhance head retention primarily thanks to their dextrines and other complex proteins. Creates soft biscuit notes in the beer aroma. Usage: Organic Pilsner Lager, alcohol-reduced beer, light beer, Bock beer. Up to 30% of the mix. Features: Unique organic roasted malt. Torrefied at up to 225°C. Characteristics: This very special organic roasted malt offers a great advantage: Château Black Of Black Nature gives the beer the flavour and aroma typical of the traditional Black malt without intensifying the beer’s colour. Imparts well-balanced and agreeable roasted notes to the finished beer. Now you can brew an amber-coloured beer with a more pronounced roasted character, which had not been possible until Castle Malting® created its unique technology for producing Château Black Of Black Nature. Usage: From amber to very coloured organic beers, Stouts and Porters. Recommended max. proportion: 5% of the mix. Characteristics: Very aromatic, with intense malty flavour. Gives fullness and roundness to the beer colour, improves flavour stability and promotes red colour in your beer. Gives beer fuller body. This specialty variety has been described as “turbo Munich”. Usage: Organic amber and dark beers, Scottish type and red coloured beers like Scottish ales, amber ales, red ales, and Irish ales. Up to 20% of the mix. Features: The lightest coloured Belgian malt. Produced from the finest European 2-row spring malting barley varieties. Kilned at up to 80 - 85°C. Characteristics: The lightest in colour, this malt is well-modified and is perfectly suited for single-step infusion or for decoction mashing. Our Château Pilsen malt carries a strong, sweet malt flavour and has a sufficient enzymatic power to be used as base malt. Usage: All beer types. Can be used up to 100 % for pale beers (Pilsner, Lager) or as part of the mix for the other beers. Features: The lightest coloured Belgian malt produced from the finest European 6-row winter barley varieties. Kilned at up to 80 - 85°C. Characteristics: The lightest in colour, this malt is well-modified and is perfectly suited for single-step infusion or for decoction mashing. Compared to Château Pilsen 2RS, Château Pilsen 6RW has a more important diastatic power. Our Château Pilsen malt carries a strong, sweet malt flavour and has a sufficient enzymatic power to be used as base malt. Usage: All beer types. Can be used at up to 50% together with Pilsen 2RS for pale beers (Pilsner, Lager) or as part of the mix for the other beers. Features: Belgian Vienna base malt. Lightly kilned at up to 85-90°C with shorter "cure" duration. Characteristics: Imparts a richer flavour of malt and grain than Pilsen malt and adds subtle aromas of caramel and toffee. Château Vienna malt is kilned at slightly higher temperatures than Pilsen Malt. As a result Château Vienna malt gives a deeper golden colour to the beer increasing at the same time its body and fullness. Due to the higher kilning temperature, the enzyme activity of Château Vienna malt is slightly lower than that of Pilsen Malt. Nevertheless, our Château Vienna malt has a sufficient enzymatic activity to be used in combination with large proportion of specialty malts. Usage: All beer styles, Vienna lager. To enhance colour and aroma of light beers. Up to 100% of the mix. Features: Belgian light-coloured base malt. Kilning at up to 90-95°C. Characteristics: Usually used as a base malt or in combination with Pilsen 2RS malt to impart a richer malt flavour and additional colour. Being deeper in colour, this malt can add a golden hue to the wort. It is used with strong yeasts to produce amber and bitter beers. Château Pale Ale malt is kilned longer and is usually better modified, providing a more pronounced flavour than Pilsen 2RS. The enzymatic activity of Château Pale Ale malt is sufficient when used with large proportion of non-enzymatic specialty malts. Usage: Pale ale styles and bitter beers, most traditional English beer styles. Up to 80% of the mix. Features: Belgian specialty malt of Munich type. Kilned up to 100-105°C. Characteristics: Rich, golden malt. Provides a modest colour increase toward a nice, golden-orange colour. Adds a pronounced grainy malty flavour to many beer styles without affecting the foam stability and body. Is also used in small quantities in combination with Château Pilsen 2RS to produce light colour beers, improving the malty flavour and giving the beer a richer colour. Enhances the taste of character beers. Usage: Pale ale, amber, brown, strong and dark beers, bocks. Up to 60% of the mix. Features: Belgian Melanoidin (Melano) malt. Special germination process. Kilned in a special way at up to 130°C. Château Melano Light malt is slowly dried as the temperature is raised, allowing the melanoidins to form as part of the kilning process. Usage: Amber and dark beers, Scottish type and red coloured beers like Scottish ales, amber ales, red ales, and Irish ales. Up to 20% of the mix. Features: Belgian Melanoidin (Melano) malt. Special germination process. Kilned in a special way at up to 130°C. Château Melano malt is slowly dried as the temperature is raised, allowing the melanoidins to form as part of the kilning process. Usage: Amber and dark beers, Scottish type and red coloured beers like Scottish ales, amber ales, red ales, and Irish ales.Up to 20% of the mix. Features: Belgian brown malt. Specially germinated and kilned at up to 110°C. Characteristics: Château Abbey® malt is a more toasted form of pale malt. Gives a strong taste of cooked bread, nuts and fruit. Château Abbey® malt has a bitter flavour which mellows on ageing, and can be quite intensely flavoured. Château Abbey® malt is typically used as a small proportion of the grist in the production of beers requiring some substantial depth of colour. Usage: Pale ale beers, Abbey beers,brown porter and special beers, in a diverse range of British beers.Up to 25% of the mix. Features: Unique and very special Belgian malt. Lightly kilned, then lightly torrefied at up to 160°C. Characteristics: Château Biscuit® malt produces a very pronounced "toasty" finish in the beer. Imparts a warm bread and biscuit-like aroma and flavour. Promotes a light to medium warm brown colour of the mash. This malt is used to improve the roasted flavour and aroma that characterize ales and lagers lending the subtle properties of black and chocolate malts. No enzymes. Must be mashed with malts having a surplus of diastatic power. Usage: All special beers and as well for English ales, brown ales and porters. Up to 25% of the mix. Features: The palest Belgian Caramel malt produced according to a special malting process. Characteristics: Château Cara Clair is a type of Belgian caramel malt. Intensifies the beer’s body and its smoothness, promotes head formation and retention. 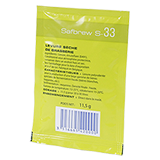 This malt also called Dextrin malt and is the most common body and foam enhancing natural agent that enhance head retention primarily thanks to their dextrines and other complex proteins. Creates soft biscuit notes in the beer aroma. Usage: Pilsner Lager, alcohol-reduced beer, light beer, Bock beer. Up to 30% of the mix. Features: A pale Belgian caramel-style malt. High temperature of germination. Taste development at up to 220°C, intense aroma. Characteristics: Château Cara Blond® imparts a mild caramel-sweet aroma adding golden colour to beer. A distinguishing characteristic of all caramel malts is glassiness. This glassy endosperm creates the desirable non-fermentable components that give true caramel malt the ability to contribute mouthfeel, head, head retention, and extended beer stability. Usage: Light lagers, light ales, with little or no alcohol, white beers. Up to 30% of the mix. Features: A medium Belgian caramel-style malt. High temperature of germination. Taste development at up to 220°C, intense aroma. Characteristics: Château Cara Ruby® malt imparts a rich caramel-sweet aroma and a toffee-like flavour, adding light amber to reddish colour to beer. A distinguishing characteristic of all caramel malts is glassiness. This glassy endosperm creates the desirable non-fermentable components that give true caramel malt the ability to contribute mouthfeel, head, head retention, and extended beer stability. Usage: Brown Ales, Brune des Flandres, Bock, Scottish Ales. Up to 25% of the mix. Features: A dark Belgian caramel-style malt. High temperature of germination. Taste development at up to 220°C, intense aroma. Characteristics: Château Cara Gold® malt imparts a strong caramel-sweet aroma and unique toffee-like and brown sugar flavour, adding a rich amber colour to beer. A distinguishing characteristic of all caramel malts is glassiness. This glassy endosperm creates the desirable non-fermentable components that give true caramel malt the ability to contribute mouthfeel, head, head retention, and extended beer stability. Usage: Brown and dark beers. Up to 20% of the mix. Features: Belgian aromatic malt. High germination temperature, kilning at up to 115°C to develop much aroma. Characteristics: Château Arôme malt provides a rich malty aroma and flavour to amber and dark lager beers. Compared to other traditional coloured malts, Château Arôme has a higher diastatic power and imparts a smoother bitterness. Usage: Special very aromatic beers. Up to 20% of the mix. Features: Distinct Belgian aromatic malt with unique aroma and flavour profile. A particular production process developed by Castle Malting®. Characteristics: This caramel-copper coloured malt provides a rich malt flavour and aroma to amber and dark lager beers. Compared to other traditional coloured malts, Château Crystal® has an even stronger diastatic power and imparts a smoother bitterness. Usage: Aromatic and coloured beers. Perfect for any beer in which high profile malt is required. Excellent choice for Belgian ales and German bock beer styles. Up to 20% of the mix. Features: Belgian coffee light malt. Kilned at up to 200°C. Characteristics: Château Café Light® malt imparts a dry and mild coffee flavour and aroma to beers. Adds a smooth mouth feel and complexity to any brown or amber ale. Brings in a sweet aftertaste. Reinforces the color of beer. Usage: Amber and dark beers. Up to 10% of the mix. Features: Belgian coffee malt. First slightly kilned then roasted at up to 220°C. Characteristics: Château Café malt imparts a nutty and distinct coffee flavour and aroma to beers, brings in a "coffee" note in Stouts and Porters. Adds a smooth mouth feel and complexity to any dark ale. Reinforces the colour of beer. Features: Very special Belgian dark malt, obtained through specific double roasting process. Characteristics: Is used to produce a deep red to dark brown-black colour and fuller body. Unique flavour and aroma. Gives much colour and raisin-like flavour. Imparts a rich malty taste and a hint of nut and plum flavour. May substitute Chocolate and Black malt if bitterness is not desired. Usage: Abbey ales, dubbels, porters, brown ales, doppelbocks. Up to 10% of the mix. Features: Belgian chocolate malt. Torrefied at 220°C and then quickly cooled when the desired colour is reached. 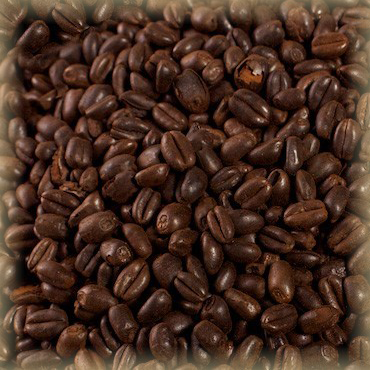 Characteristics: Château Chocolat malt is a highly roasted malt with a deep brown colour. This is where its name comes from. Château Chocolat malt is used to adjust the colour of beer and imparts a nutty, toasted flavour. 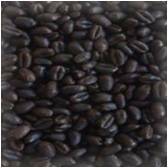 Château Chocolat malt shares many of the characteristics of Black Malt but provides a less bitter flavour than Black malt and is lighter than Black, because it is roasted for a slightly shorter period of time and the end temperatures are not so high. Usage: Brown, strong, darker and black beers, such as porters, stouts and brown ales. Up to 7% of the mix. Features: Malt Black 1300 EBC. The darkest malted barley. Torrefied at up to 235°C. Characteristics: Enhances the aroma of character beers by producing a more stringent flavour than other coloured malts. Imparts a slight burnt or smoky flavour. Usage: Very coloured beers, stouts and porters. 3-6% of the mix. Features: Unique roasted malt. Torrefied at up to 225°C. Characteristics: This very special roasted malt offers a great advantage: Château Black Of Black gives the beer the flavour and aroma typical of the traditional Black malt without intensifying the beer’s colour. Imparts well-balanced and agreeable roasted notes to the finished beer. Now you can brew an amber-coloured beer with a more pronounced roasted character, which had not been possible until Castle Malting® created its unique technology for producing Château Black Of Black. Usage: From amber to very coloured beers, Stouts and Porters. Recommended max. proportion: 5% of the mix. Features: Raw roasted barley. Torrefied up to 230 ºC. The length of roasting time determines the darkness of the grain. Characteristics: Château Roasted Barley is a highly roasted barley that imparts a burnt, grainy, coffee-like flavor to your beer. It has many characteristics of Château Black malt, though it is far more complex. It actually has some starch that can be converted during the mash, thus impacting the specific gravity. Château Roasted Barley will also lend to the sweetness to the beer. If compared to Château Chocolat and Château Black malts, roasted barley produces the lightest colored head. Imparts a deep red mahogany color to beer and very strong roasted flavor. Gives dryness to Porters and Stouts. Features: Wheat malt. Kilned at up to 80 - 85°C. Characteristics: Enhances the peculiar taste of wheat beers. Château Wheat Blanc malt is essential in making wheat beers but is also used in barley malt-based beers (3–5%) thanks to its protein level that gives the beer a fuller mouthfeel and enhanced head stability. Wheat has no outer husk and therefore has fewer tannins than barley. Wheat malt is much stickier than barley malt due to the higher protein content and may cause lautering problems if not given a "Protein Rest" during the mash. Features: Very special Belgian wheat malt of the Munich type. Kilned at up to 100-105°C. Characteristics: Not particularly dark in colour but richer in flavour than the standard Wheat malt. You will have a slimmer, more sparkling beer with a typical ale aroma. Usage: Dark wheat beer styles, weizenbocks, stouts or in smaller proportions to add body and head retention to other dark ales. Up to 30% of the mix. Features: Wheat malt. Roasted at up to 150-170°C. Characteristics: Château Wheat Crystal imparts to the beer a rich character of cooked wheat, corn flakes and a slight aroma of coffee. Increasing the coloration, our new malt will highlight the aromatic notes of baked bread and biscuit in your beer. The beer will have a golden to light amber colour and a light to medium body. Usage: Belgian Witbier; Hefeweizen; Kristallweizen, Dunkelweizens, Weizenbock; Up to 20% of the mix. Features: Château Wheat Black 1100 - 1400 EBC. The darkest malted wheat. Château Wheat Black will contribute the same deep colour characteristics to the beer as our traditional barley Chateau Black malt. Characteristics: Château Wheat Black is a very special roasted wheat malt that will add complex flavours to your beers, the most pronounced note being coffee with intense roasted characters. Thanks to our unique roasting technology, this malt will not bring any astringency to the beer. Please note you will not obtain any taste typical of non-roasted wheat malts. Usage: Dunkelweizen, Altbier, Black IPAs, Schwarzbiers, and specialty ales. Up to 20% of the mix. Features: Enzymatic malt. Produced from the finest European barley varieties. Characteristics: Provides the necessary diastatic power in mashing when low-enzyme malt or unmalted grain is used; raises the extraction efficiency. Usage: Any type of beer. Recommended: up to 30% of the mix. Features: Two row spring malting barley is selected for the production of our Château Distilling malt. Barley is steeped to 44 - 46% moisture, slightly higher than normally required for Pilsen lager style malts. Germination temperatures are controlled between 12°C - 16°C for a period of five days. Kiln cycles start at 50° - 60°C rising to 70° - 75°C. 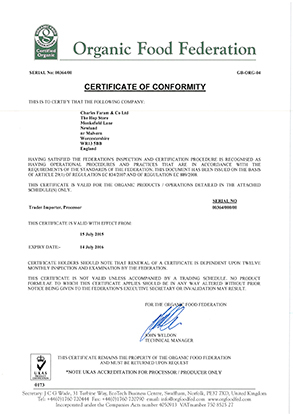 Characteristics: This is a premium Distilling malt produced especially for the distilling industry. It is used for the production of quality grain whisky. Château Distilling malt promotes high fermentability, adequate enzyme potential and soluble nitrogen (protein) levels. Our Château Distilling malt is gently kilned to preserve enzymes and maximise fermentability. Usage: Any type of whisky, real Scotch whisky. Up to 100% of the mix. Features: Treated by being smoked during kilning over a fire made from Scottish peat moss. Characteristics: Imparts a distinctive smoky, spicy aroma and flavour, typical for classic German beer styles. Smoked beer brewed with Château Peated malt tastes like a forest fire - but in a good way!! It has a rich head and a mouthfeel similar to sparkling ale. Usage: Scottish ale, porters, smoked beer, special beers. Recommended proportion: up to 10% of the mix. Features: Our Château Whisky Light® malt is smoked during kilning with the best Scottish peat. Whisky malts have a longer storage life. Characteristics: Imparts a delicate character of peat and smoke. An ideal ingredient in creating a unique whisky. In higher proportions gives your whisky a rich smoky and peaty flavour. Usage: Any type of whisky for a distinct smoky flavour of real Scotch whisky. Up to 100% of the mix. Features: Our Château Whisky malt is smoked during kilning with the best Scottish peat. Whisky malts have a longer storage life. Features: Malted from buckwheat, a pseudo-cereal*, Château Buckwheat malt is used to produce gluten-free beer. Château Buckwheat malt may contain traces of other malt grains containing gluten. *Pseudocereals are broadleaf plants (non-grasses) that are used in much the same way as cereals (true cereals are grasses). Their seed can be ground into flour and otherwise used as cereals. Examples of pseudocereals are amaranth, quinoa, and buckwheat. Characteristics: Château Buckwheat malt is used in the production of gluten-free beer. Adds a particular nutty and malty flavor to your beer. It also can be used in specialty beers to render a rich and deep tone. NB! Buckwheat malt has no diastatic power. Usage: Any type of gluten-free beer; up to 40 % of the mix. Features: Château Oat malt is produced from naked oat kernels. 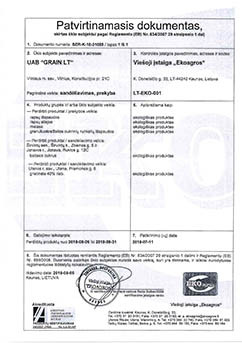 This type of malt has a very low diastatic power and moderate extract values. Characteristics: Château Oat malt gives a distinctive silkiness to the beer. Great for enhancing body, head retention, and flavor of dark beers. Used as a flavor adjunct, it enhances a biscuit taste in the beer and gives it a unique texture and a creamy mouthfeel. Adds texture and flavor to any dark English beer style. Usage: Dark beers, porters, stouts, robust British ales, winter beers. Up to 15% of the mix. Features: Château Spelt is a pale, well-modified type of malt. Made from a hard-grained species of wheat (heirloom wheat), it has a higher protein level when compared to other wheat malts. Characteristics: Château Spelt malt imparts a sweet nutty flavor, adds a spicy aroma and an earthy character to your beer. Great for Belgian Saison and Wheat beer styles. Usage: Belgian saison, wheat beers, special beers. Up to 15% of the mix. Features: Enzymatically active special type of malt used in the production of a wide variety of beer styles and whisky. Characteristics: Smoked over beech wood, this malt develops an intense smoky and sweet-key flavor in your beer or whisky. Usage: Smoked beers, specialty beers, Rauchbier, Alaskan smoked ales, Scottish ales, whisky. Up to 15% of the mix. Features: It is an acidulated with lactobacilli barley malt which lowers the mash pH and is used when brewing with bicarbonate-rich water. Characteristics: Château Acid malt improves the performance of the hydrolytic enzymes and provides a better mash working. It also intensifies the fermentation by adjusting the pH level. Acid malt enhances a well-rounded taste in your beer and gives stability to its head. Usage: Any ale or lager, wheat beers, light beers for optimizing the pH level. Features: A fully modified de-husked type of malt with high β-Glucan content. It performs well in a single temperature infusion mash. Characteristics: Gives a golden color to your beer. This malt imparts a unique touch of rye flavor and adds an interesting complexity by performing a new twist in many well-known beer styles. Usage: Rye ales and lagers, special beers, seasonal beers. Up to 30% of the mix. Features: Lightly kilned type of malt produced from steeped barley that has been germinating for a very short period of time. Characteristics: Chit Barley Malt Flakes retain many of the characteristics of raw barley and are used to improve foam stability and to balance malt with high solubility. Impart a rich dry-grainy flavor to beer and is used primarily in stout. This malt improves head formation and stability. Features: Flattened grains of chit wheat malt - lightly kilned type of malt produced from steeped wheat that has been germinating for a very short period of time. Characteristics: Chit wheat malt flakes retain many of the characteristics of raw wheat and are used to improve foam stability and balance malt with high solubility. The flakes can be added directly into the mash. Usage: Any type of beer. Features: The lightest coloured Belgian malt. Produced from the finest European 2-row organic spring malting barley varieties. Kilned at up to 80 - 85°C. Characteristics: The lightest in colour, this malt is well-modified and is perfectly suited for single-step infusion or for decoction mashing. Our Château Pilsen malt carries a strong, sweet malt flavour and contains enough enzymatic power to be used as base malt. Usage: All organic beer types. Can be used up to 100 % for pale organic beers (Pilsner, Lager) or as part of the mix for the other organic beers. Features: Belgian Vienna Nature base malt. Lightly kilned at up to 85-90°C with shorter "cure" duration. Characteristics: Imparts a richer flavour of malt and grain than Pilsen malt and adds subtle aromas of caramel and toffee. Château Vienna Nature malt is kilned at slightly higher temperatures than Pilsen Malt. As a result Château Vienna Nature malt gives a deeper golden colour to the beer increasing at the same time its body and fullness. Due to the higher kilning temperature, the enzyme activity of Château Vienna Nature malt is slightly lower than that of Pilsen Nature Malt. Nevertheless, our Château Vienna Nature malt has a sufficient enzymatic activity to be used in combination with large proportion of specialty malts. Usage: All organic beer styles, organic Vienna lager. To enhance colour and aroma of light organic beers. Up to 100% of the mix. Features: Belgian light-coloured organic base malt. Kilning at up to 90-95°C. Characteristics: Usually used as a base malt or in combination with organic Pilsen 2RS malt to impart a richer malt flavour and additional colour. Being deeper in colour, this malt can add a golden hue to the wort. It is used with strong yeasts to produce organic amber and bitter beers. Château Pale Ale Nature malt is kilned longer and is usually better modified, providing a more pronounced flavour than organic Château Pilsen Nature®. The enzymatic activity of Château Pale Ale Nature malt is sufficient when used with large proportion of non-enzymatic specialty malts. Usage: Organic pale ale styles and bitter beers, most traditional English beer styles. Up to 80% of the mix. Features: Belgian organic specialty malt of Munich type. Kilned up to 100-105°C. Characteristics: Rich, golden malt. Provides a modest colour increase toward a nice, golden-orange colour. 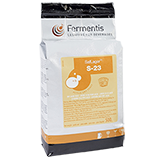 Adds a pronounced grainy malty flavour to many organic beer styles without affecting the foam stability and body. Is also used in small quantities in combination with Château Pilsen Nature 2RS to produce light colour organic beers, improving the malty flavour and giving the beer a richer colour. Enhances the taste of character beers. Usage: Organic pale ale, amber, brown, strong and dark beers, bocks. Up to 60% of the mix. Features: Organic Belgian brown malt. Specially germinated and kilned at up to 110°C. 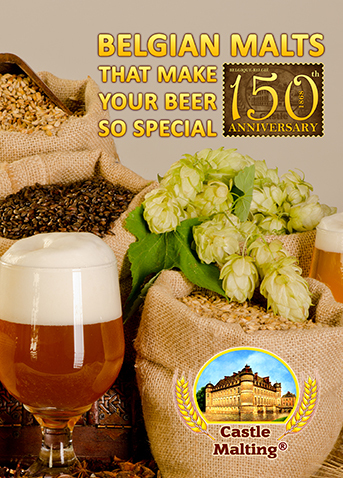 Characteristics: Château Abbey Nature® malt is a more toasted form of pale malt. Gives a strong taste of cooked bread, nuts and fruit. Château Abbey Nature® malt has a bitter flavour which mellows on ageing, and can be quite intensely flavoured. Château Abbey Nature® malt is typically used as a small proportion of the grist in the production of organic beers requiring some substantial depth of colour. Usage: Organic pale ale beers, organic Abbey beers, organic brown porter and organic special beers, in a diverse range of organic British beers. Up to 25% of the mix. Features: Unique and very special organic Belgian malt. Lightly kilned, then lightly torrefied at up to 160°C. Characteristics: Château Biscuit Nature malt produces a very pronounced "toasty" finish in the organic beer. Imparts a warm bread and biscuit-like aroma and flavour. Promotes a light to medium warm brown colour of the mash. This organic malt is used to improve the roasted flavour and aroma that characterize ales and lagers lending the subtle properties of black and chocolate malts. No enzymes. Must be mashed with malts having a surplus of diastatic power. Usage: All special organic beers and as well for organic English ales, organic brown ales and organic porters. Up to 25% of the mix. Features: A pale Belgian caramel-style organic malt. High temperature of germination. Taste development at up to 220°C, intense aroma. Characteristics: Château Cara Blond Nature imparts a mild caramel-sweet aroma adding golden colour to beer. A distinguishing characteristic of all caramel malts is glassiness. This glassy endosperm creates the desirable non-fermentable components that give true caramel malt the ability to contribute mouthfeel, head, head retention, and extended beer stability. Usage: Light organic lagers, light organic ales, organic beer with little or no alcohol, white organic beers. Up to 30% of the mix. Features: A medium Belgian caramel-style organic malt. High temperature of germination. Taste development at up to 220°C, intense aroma. Characteristics: Château Cara Ruby Nature® malt imparts a rich caramel-sweet aroma and a toffee-like flavour, adding light amber to reddish colour to organic beer. A distinguishing characteristic of all caramel malts is glassiness. This glassy endosperm creates the desirable non-fermentable components that give true caramel malt the ability to contribute mouthfeel, head, head retention, and extended beer stability. Usage: Organic Brown Ales, organic Brune des Flandres, organic Bock, organic Scottish Ales. Up to 25% of the mix. Features: A dark Belgian caramel-style organic malt. High temperature of germination. Taste development at up to 220°C, intense aroma. Characteristics: Château Cara Gold Nature® malt imparts a strong caramel-sweet aroma and unique toffee-like and brown sugar flavour, adding a rich amber colour to organic beer. A distinguishing characteristic of all caramel malts is glassiness. This glassy endosperm creates the desirable non-fermentable components that give true caramel malt the ability to contribute mouthfeel, head, head retention, and extended beer stability. Usage: Organic brown and dark beers. Up to 20% of the mix. Features: Distinct Belgian organic aromatic malt with unique aroma and flavour profile. A particular production process developed by Castle Malting®. Characteristics: This caramel-copper coloured organic malt provides a rich malt flavour and aroma to organic amber and dark lager beers. Compared to other traditional coloured malts, Château Crystal Nature® has an even stronger diastatic power and imparts a smoother bitterness. Usage: Aromatic and coloured organic beers. Perfect for any organic beer in which high profile malt is required. Excellent choice for organic Belgian ales and organic German bock beer styles. Up to 20% of the mix. Features: Very special Belgian organic dark malt, obtained through specific double roasting process. Characteristics: Is used to produce a deep red to dark brown-black colour and fuller body. Unique flavour and aroma. Gives much colour and raisin-like flavour. Imparts a rich malty taste and a hint of nut and plum flavour. May substitute Chocolate Nature and Black Nature malts if bitterness is not desired. Usage: Organic abbey ales, organic dubbels, organic porters, organic brown ales, organic doppelbocks. Up to 10% of the mix. Features: Organic Belgian chocolate malt. Torrefied at 220°C and then quickly cooled when the desired colour is reached. Characteristics: Château Chocolat Nature malt is a highly roasted organic malt with a deep brown colour. This is where its name comes from. Château Chocolat Nature malt is used to adjust the colour of organic beer and imparts a nutty, toasted flavour. Château Chocolat Nature malt shares many of the characteristics of organic Black Malt but provides a less bitter flavour and is lighter than Black, because it is roasted during a slightly shorter period of time and the end temperatures are not so high. Usage: Brown, strong, darker and black organic beers, such as porters, stouts and brown ales. Up to 7% of the mix. Features: Organic black malt 1300 EBC. The darkest malted organic barley. Torrefied at up to 230°C. Characteristics: Enhances the aroma of character organic beers by producing a more stringent flavour than other coloured malts. Imparts a slight burnt or smoky flavour. Usage: Very coloured organic beers, organic stouts and porters. 3-6% of the mix. Features: Organic wheat malt. Kilned at up to 80 - 85°C. Characteristics: Enhances the peculiar taste of wheat organic beers. Château Wheat Blanc Nature malt is essential in making wheat organic beers but is also used in barley malt-based organic beers (3–5%) thanks to its protein level that gives the beer a fuller mouthfeel and enhanced head stability. Features: Light brown organic caramel wheat malt with malty odour and sweet malty taste. Characteristics: Enhances the peculiar taste of organic wheat beers. Château Cara Wheat Blond Nature malt is essential in making wheat organic beers, but is also used in barley malt-based organic beers (3–5%) like Brown Beers, Belgian Dubbel, thanks to its protein level that gives the beer a fuller mouthfeel and enhanced head stability. Features: Peated malt from organic barley. Treated by being smoked during kilning over a fire made from Scottish peat moss. Characteristics: Imparts a distinctive smoky, spicy aroma and flavour, typical for classic German beer styles. Organic smoked beer brewed with Château Peated Nature malt tastes like a forest fire - but in a good way!! It has a rich head and a mouthfeel similar to sparkling ale. Usage: Organic scottish ale, organic porters, organic smoked beer, special organic beers. Recommended proportion: up to 10% of the mix. Features: Our Château Whisky Light Nature malt is smoked during kilning with the best Scottish peat. Whisky malts have a longer storage life. Characteristics: Imparts a delicate character of peat and smoke. An ideal ingredient in creating a unique organic whisky. In higher proportions gives your whisky a rich smoky and peaty flavour. Usage: Any type of organic whisky for a distinct smoky flavour of real Scotch whisky. Up to 100% of the mix. Features: Our organic Château Whisky Nature malt created with love for your whisky is smoked during kilning with the best Scottish peat. Whisky malts have a longer storage life. Features: Malted from buckwheat, a pseudo-cereal*, Château Buckwheat Nature malt is used to produce organic gluten-free beer. Château Buckwheat Nature malt may contain traces of other malt grains containing gluten. *Pseudocereals are broadleaf plants (non-grasses) that are used in much the same way as cereals (true cereals are grasses). Their seed can be ground into flour and otherwise used as cereals. Examples of pseudocereals are amaranth, quinoa, and buckwheat. 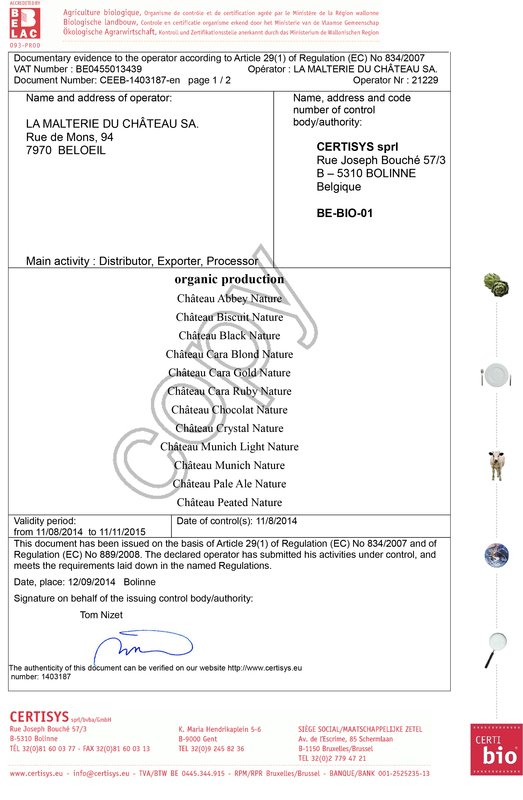 Characteristics: Château Buckwheat Nature is used in the production of organic gluten-free beer. Adds a particular nutty and malty flavor to your beer. It also can be used in specialty beers to render a rich and deep tone. NB! Buckwheat malt has no diastatic power. Usage: Any type of organic gluten-free beer. Up to 40% of the mix. Features: Château Spelt Nature is a pale, well-modified type of organic malt. Made from a hard-grained species of organic wheat (heirloom wheat), it has a higher protein level when compared to other wheat malts. Characteristics: Château Spelt Nature malt imparts a sweet nutty flavor, adds a spicy aroma and an earthy character to your beer. Great for Belgian Saison and Wheat beer styles. Usage: Organic Belgian saison, organic wheat beers, special beers. Up to 15% of the mix. Features: Enzymatically active special type of organic malt used in the production of a wide variety of organic beer styles and organic whisky. Usage: Smoked organic beers, organic specialty beers, organic Rauchbier, organic Alaskan smoked ales and Scottish ales, organic whisky. Up to 15% of the mix. 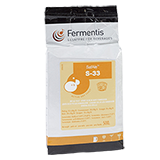 Features: It is an acidulated with lactobacilli organic barley malt which lowers the mash pH and is used when brewing with bicarbonate-rich water. Characteristics: Château Acid Nature malt improves the performance of the hydrolytic enzymes and provides a better mash working. It also intensifies the fermentation by adjusting the pH level. Acid malt enhances a well-rounded taste in your beer and gives stability to its head. Usage: Any organic ale or lager, organic wheat beers, light beers. Features: Château Oat Nature malt is produced from naked organic oat kernels. 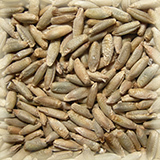 This type of malt has a very low diastatic power and moderate extract values. Characteristics: Château Oat Nature malt gives a distinctive silkiness to organic beer. Great for enhancing body, head retention, and flavor of dark beers. Used as a flavor adjunct, it enhances a biscuit taste in the beer and gives it a unique texture and a creamy mouthfeel. Adds texture and flavor to any dark English beer style. Usage: Dark organic beers, organic porters, organic stouts, robust organic British ales, winter beers. Up to 15% of the mix. Features: A fully modified de-husked type of organic malt with high β-Glucan content. It performs well in a single temperature infusion mash. Usage: Organic rye ales and lagers, organic special beers, seasonal beers. Up to 30% of the mix. Features: Lightly kilned type of malt produced from steeped organic barley that has been germinating for a very short period of time. Characteristics: Chit Barley Malt Flakes Nature retain many of the characteristics of raw barley and are used to improve foam stability and to balance malt with high solubility. Impart a rich dry-grainy flavor to organic beer and is used primarily in organic stouts. This malt improves head formation and stability. Features: Flattened grains of chit wheat malt - lightly kilned type of malt produced from steeped organic wheat that has been germinating for a very short period of time. Characteristics: Organic chit wheat malt flakes retain many of the characteristics of raw wheat and are used to improve foam stability and balance malt with high solubility. The flakes can be added directly into the mash. Usage: Any type of organic beer.